How Does Lightning Impact an Alarm System? 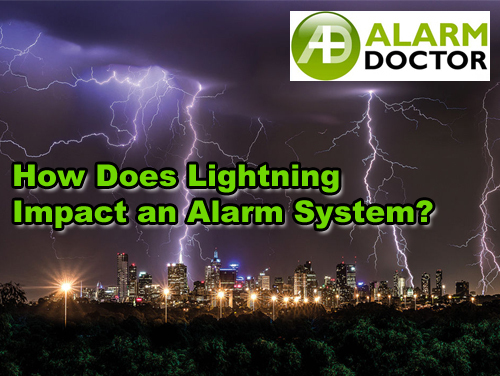 Alarm Doctor > alarm system > How Does Lightning Impact an Alarm System? Lightning is a result of immense thunderstorms of several thousand miles in height and hundreds of miles in width. Lightning storms can cause severe damage to properties and people. However, it is hard to determine lightning strikes’ damages to properties. Even firefighters have difficulty in finding the external damages caused by lightning strikes. Lightning strikes are frequent concerns for security alarm technicians, as the unexpectedness and swiftness of the lightning strikes. The damages a lightning strike can cause vary based on its severity. Sometimes, the damage can be at the minimal level like a damage lone device which is connected to a low-voltage cord. On the other hand, lightning strikes can damage an entire burglar or fire alarm system. At times, the damage is little, while it may be disastrous at times; it burns down the alarm system throughout. Alarm technicians can only minimize the damages, by implementing proper alarm installation procedures and becoming aware of how lightning strikes work. How Lightning Finds Its Way Into the Alarm Systems? Devices that are connected to metal wires can be damaged by lightning strikes, no matter if it a direct or an indirect hit. There can be times when lightning results in permanent damage, regardless of what preventive measures are taken. When it comes to direct lightning hit to a device, it can get through different paths from the exterior. For instance, a college or school campus with several buildings can be a good example. On the other hand, lightning strikes can damage the structure of electric buses by entering through wires of paid subscription services or power lines. Satellite dish systems, television network cables, and traditional telephones can be perfect examples for this scenario. When it comes to a fire or burglar alarm system, lightning can strike through devices by any of the methods state above. And when it does, it may move around SLCs (Signaling Line Circuits), NACs (Notification Appliance Circuits), IDCs (Initiating Device Circuits) or any other low-voltage wires. Coaxial cables ad unshielded wires are other great examples for the above-cited method of lightning strike damages. How you can save your Alarm Systems from Lightning? Let us take a closer look at the impacts of lightning on an alarm system. Lightning damages alarm systems not only by direct hits, but also indirect hits. If there is an electrical conductor around a building that is struck by lightning, it becomes vulnerable to damages. The National Weather Service states lightning can enter into a building by three methods. They are direct hit through pipes or wires from outside the building and by the ground. Since conventional alarm systems are vulnerable to lightning; alarm technicians suggest wireless alarm systems to people. This is because wireless security systems, obviously have no wires, they can withstand lightning strikes. We install / replace damaged alarm system. Also produce a damage report to your insurance claim in 2 hours only! Contact us for more details.